Update Freezer is a nifty portable software which can let you control automatic updates of popular programs in Windows. You can enable, disable or set other options for automatic updates of different programs in one place. Most programs nowadays come with automatic updates feature which means that the program gets updated without notifying the user. This is beneficial for many users who don’t bother about what the new features are in the new version of the software. No matter what, they only want to run the latest version of the software. Update Freezer comes in handy due to the fact that it can combine all the control of automatic update functionality of many essential programs in Windows. 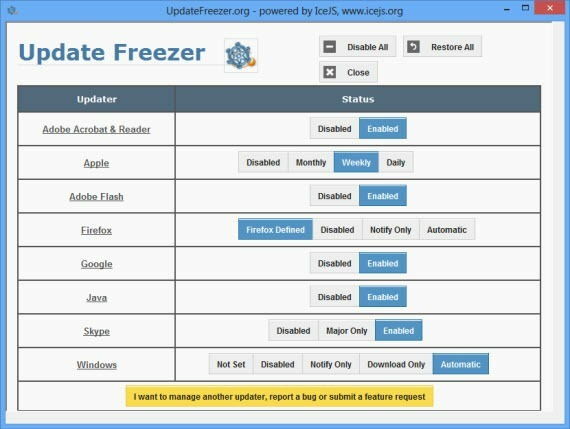 Update Freezer supports controlling automatic updates for Adobe Reader, Adobe Acrobat, Adobe Flash, Apple updater, Firefox, Google for updating Google Chrome and other Google products, Java, Skype and Windows Updates. Using Update Freezer is very simple as the interface offers only one screen for all configuration. You need to select an configuration option for each product. There is also a single button for disabling all the automatic update functions of all the products. The user can also restore the default options by clicking the Restore All button. Most of the products have only two options, enable or disable automatic updates. For some products, there are advanced options like for Firefox, you can select notify only or the settings defined by Firefox itself. For Windows Updates, you can select Not set, Notify only, Download only besides the default enable and disable options. Overall Update Freezer can be a handy program especially when one can take it in a USB Flash drive and use it as a portable utility. Combining many configuration settings into one screen gives Update Freezer the power to be loved by System Admins and power users. Update Freezer works on Windows Operating Systems including Windows XP, Windows Vista, Windows 7 and Windows 8. Both 32-bit and 64-bit Operating Systems are supported. After using the utility, do tell us about your experience about the utility. I have tested it once and now placed it in the portable apps folder which I use to take in my USB flash drive.